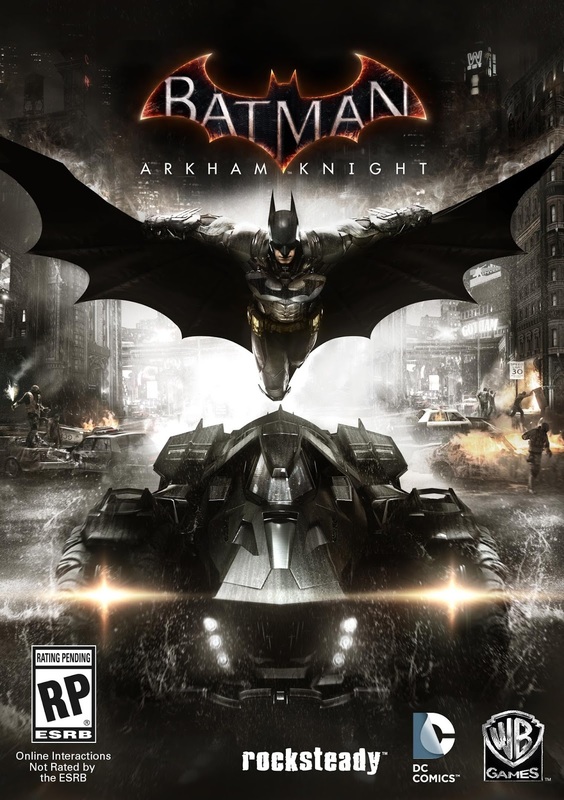 I broke my usual rule by buying Batman: Arkham Knight new rather than waiting for it to be reduced in price, Batman: Arkham Asylum and Batman: Arkham Origins were both fantastic games, while Batman: Arkham City was ok and so I was excited for this new and allegedly last in the series. There was a huge fuss over a costly season pass, impossible to get pre order DLC and there are a scary amount of issues with the buggy PC port so things did not start off great. 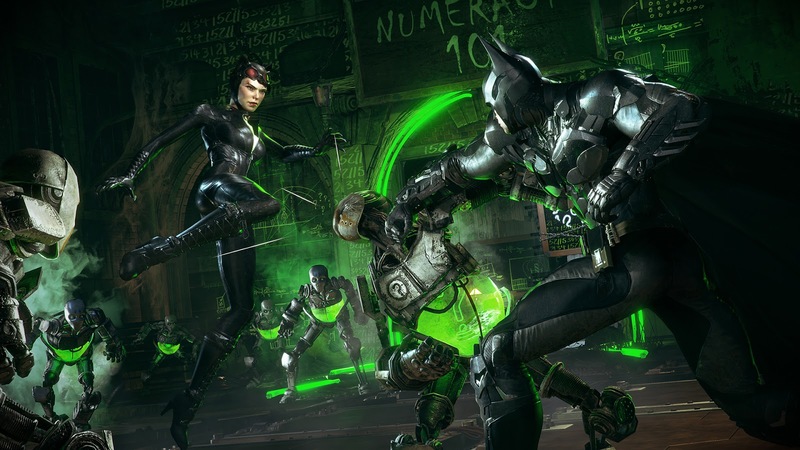 Spoilers will for Arkham City will be upcoming. Taking place nearly a year after the events of Arkham City the game begins with the Scarecrow unleashing a terror attack in a diner. He reveals to the people of Gotham that in 24 hours time he will unleash his fear gas across the whole city, this in turn causes a massive evacuation of the place with the only people staying behind being criminals and the police (as well as Batman of course). Scarecrow has teamed up with a mysterious solider named the Arkham Knight who is in command of a huge army that quickly takes over the town and so with the odds stacked against him over one evening he must save the day once again. The biggest change for this new game in the series is that you now have access to the Batmobile throughout. The vehicle has two different modes, the driving mode which has a boost, and a tank mode where you can use both machine guns and missiles as well as use a winch to solve various environmental puzzles. The car is a lot of fun to drive, and you get to drive it around the biggest Arkham game yet. The tank mode of the car is used a lot as there is a heck of a lot of tank vs tank battles going on, a fair few of the side quests involve this tank as well as (too many) story missions. Having completed the game now my first complaint would be that the tank fights got kind of stale by the end, the decision to have several boss fights be vehicle based was a bit of a let down as they are never fun, involving as they do stealth based combat. One iconic fight I was looking forward to against a villain of a previous game ended up being just a tank battle when the boss fight he appeared in, in Origins was really quite special and taxing. From my memory all but one of the boss fights in the game are vehicle based ones and quite dull. Hand in hand with this over reliance on vehicle combat is the fact that there really are not many traditional level based missions here, much has been made of the fact there are no load screens once the game has started but with only a handful of small indoor locations that doesn't seem as special. The open world nature seemed to lead to a huge proportion of the game taking place out on the city streets. For the most part the main story missions were not fantastic, nothing really stood out, thankfully there are a lot of side quests that are a lot better than the forgettable ones of City. A lot of these side quests involve taking out various parts of the Kinght's armies control on Gotham (destroying watch towers, check points, bombs, and chasing down commanders) but a fair few others involve various super villians. Being the fourth game in the series (fifth if you include Batman: Arkham Origins Blackgate) a lot of these characters you have faced before so some of the more obscure ones turn up, so as well as the usual ones such as Penguin, Two Face, Riddler and Scarecrow you get less known ones such as Man-Bat and Simon Stagg. The side quests while fun are the same every time for each villain (eg: stopping Two Face bank robberies, and finding Penguins weapon shipments). With Joker killed I had figured he would still make an appearance somehow yet the way it is done was not the best. Due to Batman still being infected by the Joker virus he contracted previously, and coupled with Scarecrow using fear gas on him, for a lot of the game you are followed around by the ghostly presence of Joker who makes jokes and observations throughout, coming across like a comedy side kick. He must have the most lines of any Batman game as he really never shuts up and I mostly found him irritating, especially a very ill judged musical number that made me cringe a lot. 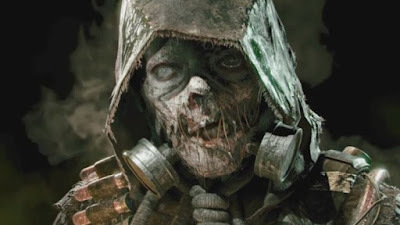 As a main villain I was disappointed by Scarecrow, he has no real prescence in the game, mostly appearing on bill boards broadcasting messages, the few times you actually encounter him are underwhelming, the plot in general was not exciting or that interesting. 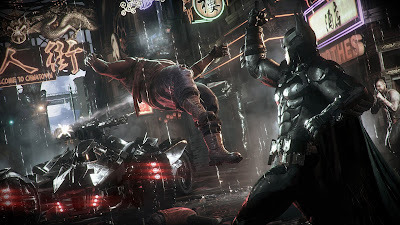 The mystery of just who the Arkham Knight was I found initially to be fun but the game extremely heavily fore shadows who it is going to be and so when the reveal came I was not in the least bit surprised, more could have been done with that aspect. That said there were a couple of moments were I really was taken by surprise on where the story went and it ends fantastically. Combat is as solid and fun as ever while you start the game with a lot of the gadgets and skills you gained in the previous ones in the series. A new Batsuit leads to a new type of fear based take down that was a neat addition, while at several points you get to team up with other heroes that leads to some cool duel take downs. All these controls along with all the new Batmobile controls led to me getting quite confused. The grapple ability that lets you glide around the city is a lot better this time around, you can easily get anywhere in quite a short space of time. As before there are Riddler trophies hidden everywhere, around 243 of the damn things, they seem easier to collect but I wish they wouldn't stick so many in the games, 100 would be ideal. There are also other challenges such as destroying military emblems and solving riddles which when done lead to some short stories and recordings that were all pretty decent. Unlike the other games it is essential you do the Riddler challenges as it is only when they are all completed you get the games ending. What was the best for me was just how much of the past games were referenced, while the team who made this had nothing to do with Origins and Blackgate those games are still referenced a lot, especially Origins, it was great getting so many nods for fans of the series. Also making a very welcome comeback was battle damage on Batman's suit, this also applies to his Batmobile. In this game the GCPD acts as a kind of hub were the cells gradually fill up as you progress the stories giving you a real sense of progression, about the best thing about Arkham Knight. Arkham Knight looks and sounds fantastic, I just wish the story had been better and that the level design was a lot more varied and interesting. While the Batmobile is a needed addition I dislike how much focus of the game is put on the dull tank combat, and how there are no decent boss fights at all. More could have been done with the fear side of things, I was expecting at the least one platform section involving Batman having a nightmare. I had fun with Arkham Knight, and it was better than City but does not come close to rivalling the stories of Asylum and Origins. Time will tell if the extensive DLC is actually worth getting, having played the Harley Quinn DLC I can report it was fun but very brief, length being my biggest concern for the rest of the additional missions to come.